August | 2011 | DEBtastic Reads! Slowly, but surely, I’m putting this blog together. 😉 I’ve added links to my Friday Favorites posts (see above). Enjoy! And thanks for stopping by! This blog’s “grand opening” is slated for September 6th with a very special author/book feature! Come back soon! Congratulations to author, Cynthia Leitich Smith, on the release of her first graphic novel – Tantalize: Keiren’s Story (illustrated by Ming Doyle, Candlewick Press, 2011)! For fans of Cyn’s awesome series, Tantalize, Eternal, and the newest – Blessed (which I’m dying to read), this graphic novel tells Keiren’s (a hybrid werewolf) side of things. Excellent! I’m still slowly getting ready for this blog to be ready by Sept. I’m now shooting for after Labor Day – Sept. 6 or maybe the 8th. I plan to post here on Tuesday and Thursdays – author interviews, book buzz, favorite books, and industry news. Anything else you’d like to see here? I do plan to keep my LiveJournal blog: One Writer’s Journey That will continue to contain more personal posts about my travels, food adventures, home stuff, and my personal writing process. What’s New Here: I added a page (see tabs above) called Coffee Break Tuesdays, where I share links to my Coffee Break Tuesday author interview series. Thanks for stopping in! If you’d like to be informed about new posts, please feel free to subscribe (in the lower part of the right column)! I plan to make a feed for LJ when this site is ready. Any input is welcome! Book Buzz! Oh Boy Oh BOY! For fans of the fabulously swoon-worthy YA novel Anna & the French Kiss by Stephanie Perkins (I’m such a fan that I’m currently reading it for the second time), I just found out there will be a companion novel! 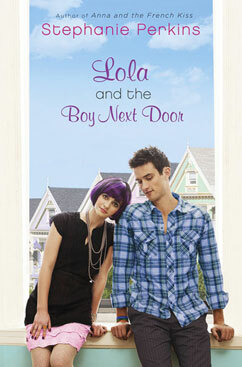 Lola & The Boy Next Door is supposed to be released on Sept. 29th! I’ve already pre-ordered it and it will be automatically downloaded to my Kindle on that date! Woo!!!! For more about the book, check out this link. This blog will feature interviews with young adult and middle grade authors, book buzz about soon-to-be released or recently released books, and links to great author sites! I’ll be importing interviews and other book related posts from my other blog. I hope to have this site up and running by September 1st, so be sure to keep checking back!